OBJECTIVE: The burden of visceral adipose tissue as opposed to subcutaneous adiposity is an independent risk factor for poor outcomes in oncologic resection for multiple cancer subtypes (hepatocellular carcinoma, renal cell carcinoma, pancreatic, colorectal, and gastric cancer). The burden of visceral adiposity which can be reliably and reproducibly quantified by three dimensional body imaging does not correlate well with subcutaneous adiposity which is represented by anthropomorphic measurements like body mass index (BMI). Strategies for pre-operative reduction of visceral adiposity in the abdomen have improved surgical outcomes for upper abdominal surgical interventions such as gastric bypass. We hypothesize that increased visceral adiposity in the pelvis impairs surgical feasibility, increases peri-operative morbidity, and worsens oncologic outcomes for rectal cancer patients undergoing resection. Pelvic visceral adiposity may represent an important modifiable risk factor and an opportunity for low risk pre-operative intervention to improve outcomes. DESCRIPTION OF TECHNOLOGY: Quantification of pelvic visceral adiposity: Measurements will be performed on pre-operative pelvic magnetic resonance (MRI) or computed tomography (CT) imaging of the pelvis. Anteroposterior diameter and left to right diameter of peri-rectal adiposity measured at a single slice 4 cm and 7 cm below S1-S2, respectively, on CT or T1 weighted MRI correlates closely with total mesorectal adipose volume and are highly reproducible. Pre-operative caloric restriction: The impact of brief pre-operative weight loss on surgical outcomes has been most rigorously studied in the setting of bariatric surgery where even 4% loss pre-operatively improves surgical outcomes. Brief, very low energy diets target intra-abdominal visceral adiposity, losses of 8% at 2 weeks and 13% at 4 weeks have been observed. Visceral adiposity is preferentially lost in the setting of moderate weight loss and in diet induced weight loss as opposed to exercise induced weight loss. Consultation with nutritionists during diet implementation encourages low attrition and high compliance. Given the correlation between mesorectal adiposity and intra-abdominal adiposity, we hypothesize that a similar pre-operative dietary intervention would be effective in reducing pelvic visceral adiposity in rectal cancer patients, although this has never been studied. PRELIMINARY RESULTS: Feasibility assessment of our target population for a pilot study was undertaken. Sixty-five patients underwent proctectomy (LAR or APR) for rectal carcinoma from 2006 to 2010. When we stratified them by BMI (range 20 to 47, median 28.5), 43% were considered obese (BMI>30). Reviewing data from the last 5 years allows us to project rates of accrual for our prospective trial. BMI was >30 in 67%, 25%, 50%, 42%, 36% from 2006-2010, respectively. FUTURE DIRECTIONS: Pilot study: Pelvic adiposity measurements will be correlated with surgical outcomes of patients who underwent proctectomy (LAR or APR) for rectal carcinoma between January 2006 to December 2010. 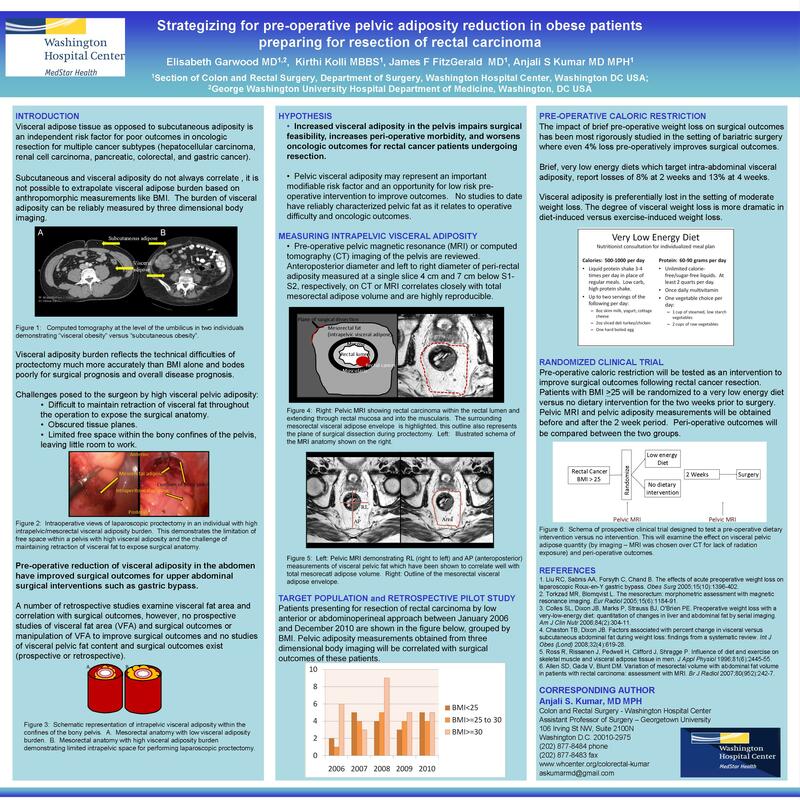 Prospective trial: Caloric restriction will be tested as an intervention to reduce pelvic adiposity and improve outcomes in rectal cancer patients planning resection. Since, BMI does not necessarily translate to pelvic adiposity, we should consider accruing all patients presenting for proctectomy. At our institution, this is about 12-18 patients per year.